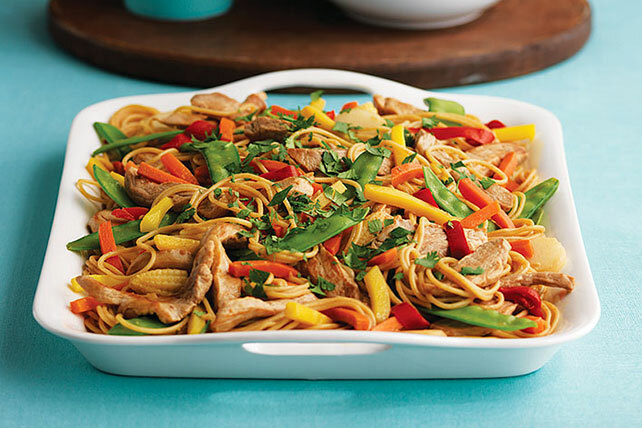 Stir up this version of a Chicken Lo Mein with chicken, crunchy peppers and a creamy smooth peanut sauce. This easy recipe is our version of a Chinese menu favorite. Meanwhile, heat dressing in large nonstick skillet on medium-high heat. Add chicken and garlic; stir-fry 5 min. or until chicken is no longer pink. Add vegetables, broth and peanut butter; stir-fry 3 to 4 min. or until chicken is done. Drain spaghetti; return to pan. Add chicken mixture and soy sauce; mix lightly. Spoon onto platter; top with cilantro and nuts. Prepare using multi-grain spaghetti, and substituting 2 thinly sliced green onions for the cilantro. Spicy Chicken Lo Mein: Add 1/4 tsp. crushed red pepper to the hot dressing along with the chicken and garlic. Pork Lo Mein: Substitute 1 lb. pork tenderloin, cut into strips, for the chicken, and fat-free reduced-sodium beef broth for the chicken broth.